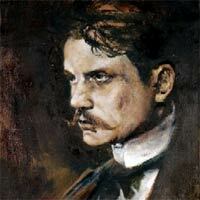 Jean Sibelius - Finland's greatest composer. Explore his troubled life and powerful nationalist music in this biography. Jean Sibelius was born in 1865 in a small town in Finland. An absent-minded young boy who daydreamed a lot, he loved to read and devoured all kinds of books. It wasn't until he took up piano and later violin that his natural talent began to show. He started playing music with his siblings, studying harmony and theory on his own. He became addicted to composing music, so much that it affected his performance at school. He went to Helsinki to study law (on the surface), but ended up becoming the city's brightest young violinist and composer. Finland entrusted him with a grant to study music in Berlin. Sibelius didn't like Berlin, and went to Vienna the next year where he was satisfied and learned a lot from the best musicians and teachers of the day. He ended up back in Helsinki teaching violin and music theory. He continued composing, having small successes here and there, an even scoring a 10-year grant which eased his economic situation. But his big international breakthrough came in 1900, where a tour of his work through 13 cities awakened Europe to this astonishing new composer. His First Symphony was hailed as remarkable. Over the next few years his fame and esteem grew. He was composing popular pieces which critics also saw as masterful and innovative. But Jean Sibelius always had money problems - he lived beyond his means, and his growing family made it harder to cope. He wasted money on lavish restaurants and entertainment, and started developing an alcohol problem. In 1904 the composer and his family moved to Ainola, a small house by a lake. Sibelius started to work harder and spend less during this time, but he still had massive debts and liked to get drunk. As the years went by Sibelius became astronomically famous and exalted. In the 1920s he was hailed as a national hero of Finland. He was an international superstar conductor, one of the grandest maestros of age. But his addiction to alcohol created a black chasm in his life which gnawed away at his music. "To be able to live at all I have to consume alcohol" he wrote in his diary. The idea of an alcoholism treatment center (SPONSORED LINK) was virtually unheard of in the 19th century, when a lot of people were essentially addicted to alcohol. In 1926 he drastically cut down the time he spent composing. He only composed small-ish pieces for the next few decades, and spent more time outdoors and reading. By his 70th birthday he was the most popular living composer in the USA and Britain. He struggled with a final, 8th Symphony for many years, but ended up burning his sketches. From the 1940s until his death in 1957, Sibelius composed next to nothing. He cut his musical activities down to editing a few old pieces and reading modern musical journals. His funeral was a huge event. Mourners lined the streets, and thousands of fans paid homage to him in his coffin. He was buried in Ainola. Beethoven received a similarly grand funeral. Jean Sibelius's music has a unique, modern sound. At its core is the influence of Finnish folk melodies and rhythms, as well as the composer's complete mastery of orchestral colors and shades. A patriotic Finn (he refused to leave his homeland even when Russia invaded in World War II), Sibelius loved the countryside. he found immense pleasure in walking in nature, and was frequently inspired to write music from his experiences and observations in the outdoors. He was also heavily inspired by Nordic folk legends, basing a fair amount of his tone poems on old stories and literature. His style of composing changed as he got older. At first, he was heavily influenced by Richard Wagner. Later on he developed his own style. One of his trademarks was playing a melody very slowly, transforming it over the course of an entire work. He also experimented with advanced harmonies. I find Sibelius's music a bit too simple at times. But then I listen closer, and it's the starkness and depth of what is played that makes his art unique. Jean Sibelius criticized his own work a lot. As you know from the biography he spent almost two decades on a final symphony before destroying the manuscript. Kullervo (Op 7). A symphonic poem from early in Sibelius's career. Based on an epic poem, the piece describes episodes in the life of Kullervo, a tragic character in Finnish mythology. Seven Symphonies. These are the main elements of the composer's output. From the first, which garnered him an international breakthrough, to the seventh, an ingenious one-movement piece, Sibelius used each new Symphony to alter and evolve his musical style and use of structure. Sibelius Finlandia (Op. 26). Sibelius's most famous piece. A grand orchestral tone poem, protesting against the Russian Empire's stranglehold of Finland. The work is powerfully nationalistic, illustrating with dramatic and stormy music Finland's struggle. En Saga, another early orchestral tone poem. The title translates to "a fairy tale". However, the composer stated later in his life that it was a musical painting of his inner life at the time, and doesn't represent any particular story. Karelia Suite (Op. 11). A set of small orchestral pieces, inspired by folk melodies and the spirit of the Finnish countryside. The music of the miniatures is deliberately rough and rustic. It's one of the composer's most popular pieces. Sibelius Violin Concerto (Op. 47). Sibelius's only concerto. A slightly disturbing piece, it has a grand scope and an impressively flashy violin part. Tulen Synty (Op. 32). This means The Origin of Fire. Another tone poem inspired by an epic poem. Featuring a baritone singer and orchestra, this is a sombre, powerful piece full of Sibelius's typical sound. The Sibelius's Violin Concerto, a fantastically complex and dramatic concerto. The rough and patriotic Karelia Suite. Finlandia, the composer's most well-known piece, and his homage to his beloved native land. En Saga, a grand musical fairy tale.